Winter (such as it was) seems to be on it’s way out! The sun has started showing its face, and blossom is appearing on the trees. With spring on its way, school holidays started and bank holidays just round the corner many will think it’s a good time to think about climbing one of the three major peaks in the UK. But don’t be fooled by conditions at the foot of the mountains – at the summits it can be very different indeed! If you visit Ben Nevis you’ll find that there has been a thaw up to about the 3000 ft level, but there’s still another 1000 ft to go to the summit and you will definitely need ice axes and crampons (and be experienced in using them!). You’ll find exceptional snow, up to 3 to 4 metres deep in places, which covers the summit cairns. 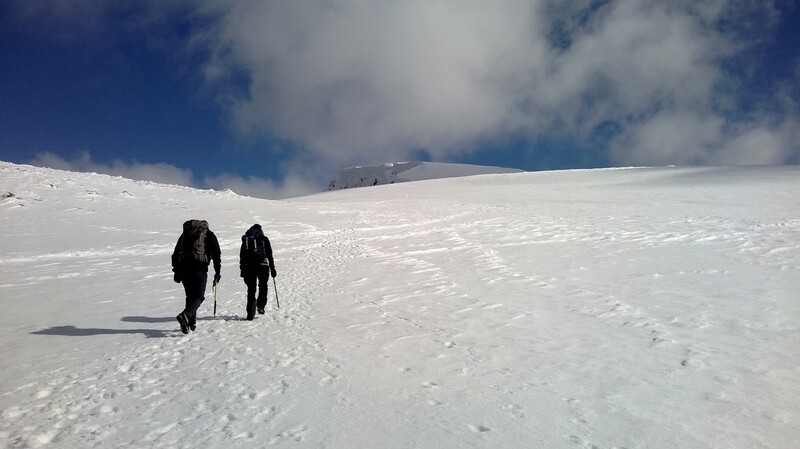 The picture above shows recent conditions on the approach to the summit. At the moment there is very little snow on Scafell Pike, but weather conditions can change very quickly. Although the temperature in the valleys might feel mild, on the summit it will often be well below zero. On Snowdon there are still some small areas of snow, but these are mainly above 800 metres. Subject to weather conditions the summit building will be opened on Thursday, 17th April, the same day the trains will start running to the summit. To book online and be sure of a seat call 0844 493 8120. When people get into trouble on the mountains it is normally as a result of being ill prepared for the conditions they will face. Walking to the summit of one of the highest peaks in the UK is not a walk in the park, however sunny and warm the day might be when you start out, and however clearly you think the path is marked. Some accidents are unfortunately fatal – these are serious and challenging walks. With a little preparation you can have an enjoyable and safe walk. In the wet the uneven paths will be slippery, so proper walking footwear is essential. If snow is lying on the higher levels you will need to be equipped with ice axes and crampons. It goes without saying that you must have a map and compass with you – cloud can descend at any time! Warm and waterproof clothing is a must – the temperature at the summits will be far below that at sea level. Having an emergency foil blanket (costing only a couple of pounds) with you could save your life if you do slip and fall, and need to wait to be rescued. There’s no point taking brand new equipment with you if you don’t know how to use it! Practice with your ice axe before you need it to stop a slide in an emergency. And be sure to know how to orient your map and use it to navigate a path. Always check the weather before starting your walk – if it’s not a good day to go, don’t. The mountain will still be there another day. Take note of the forecast and equip yourself as necessary. If conditions worsen when you are walking don’t try and achieve the summit at all costs – turn back. To check the conditions on Snowdon check out the Mountainsafe website. For Scafell Pike check Weatherline. And for Ben Nevis visit the Mountain Weather Information Service. To understand what the various conditions might mean to your walk, find information and advice on the main MountainWalk website. Have fun, enjoy your walk. But keep safe!